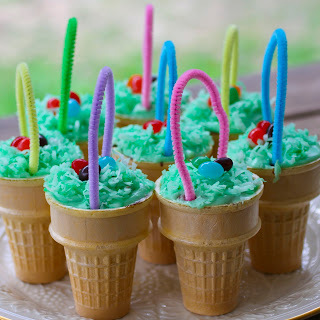 Cupcakes in Ice Cream Cones? Who knew? We love it!! I like to fill my baskets with strawberry cake, but you can use whatever flavor cake you choose – be creative! 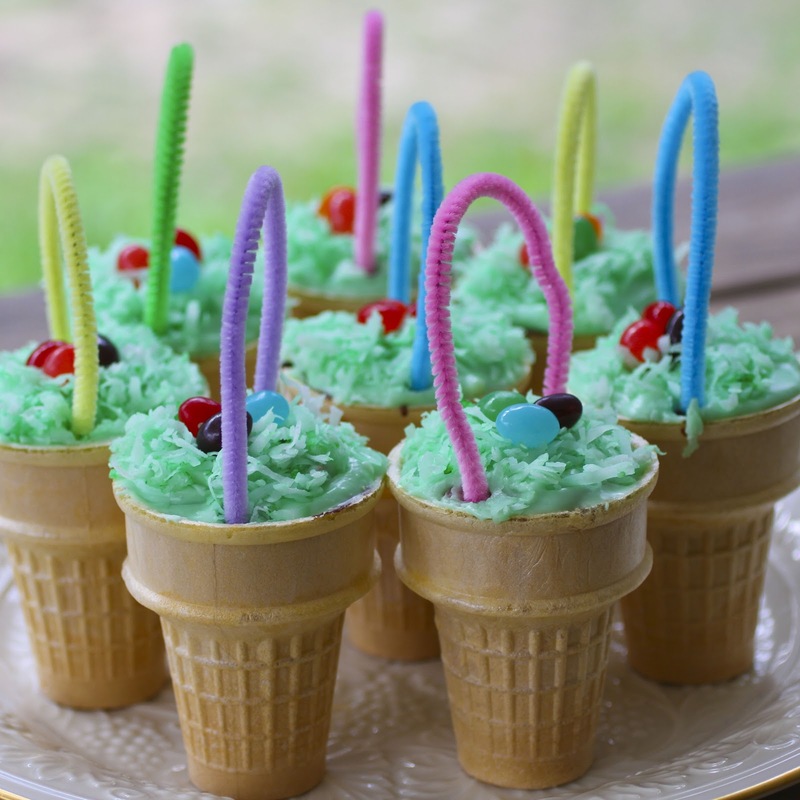 Fill 2 standard cupcake pans with ice cream cones. I usually buy more cones, than I need just in case a few are cracked or crushed. Prepare your cake batter. Carefully spoon the batter into each ice cream cone, filling them to about 1/2 inch from the rim. Bake according to your recipe’s directions for cupcakes (usually about 20 – 30 minutes). I ALWAYS check the centers for doneness with a toothpick. If the batter spills over the top and down the side of a cone, don’t worry about it. Just pick it off when the cake cools. Frost the top of each cone. I use a basic buttercream, or cream cheese frosting, and tint it green with a drop of food coloring. To tint your coconut, put a drop or two of food color in a medium size plastic container. Add a cup or so of coconut, leaving at east two inches of headspace. Cover the container with a lid, and shake it. The food color with turn your coconut green. Decorate the frosted tops with chocolate and candy from the Nutman Co! Finally, insert your pipe cleaners. Happy Easter!